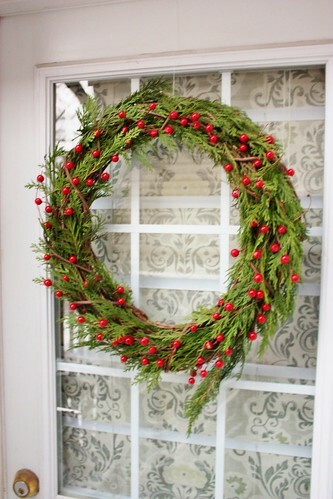 Adding a wreath to our front door is one of my favourite ways to spruce up our home each season. It’s a friendly greeting to visitors and is a nice “welcome home” for us. 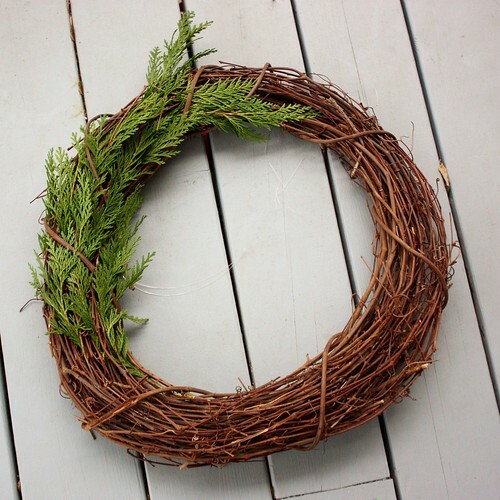 Inspired by the greenery we saw used everywhere at Black Creek Pioneer Village this weekend, I made a simple Christmas wreath that included some of the great outdoors. 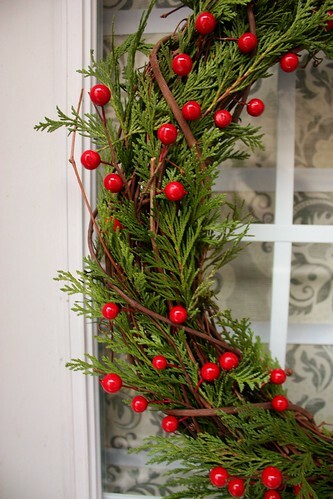 A grapevine wreath form is updated with fresh cedar branches and faux red berries, while still keeping some of the vine exposed. I’ve used the grapevine wreath form twice before with my fall decor (2012 and 2013), just removing the decorations off it each season to have it ready for the next. 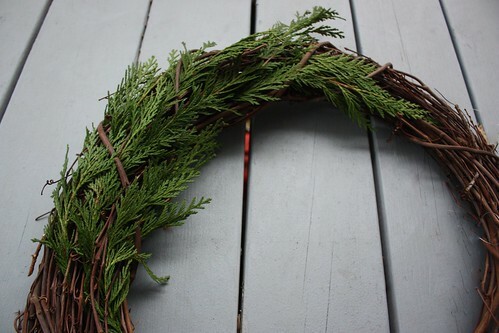 Someday I hope to attempt to make my own wreath form using the grapevines that I grow at my parents’ house. 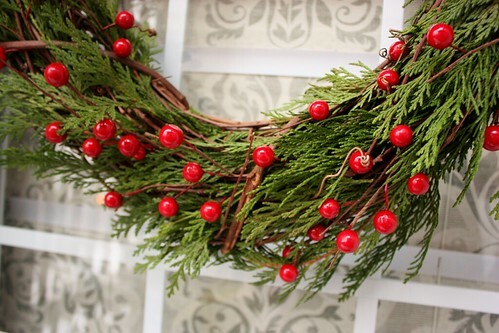 fresh evergreen greenery like cedar or pine (If you don’t have some in your backyard, it’s available at most garden centers, home improvement stores and even some grocery stores. 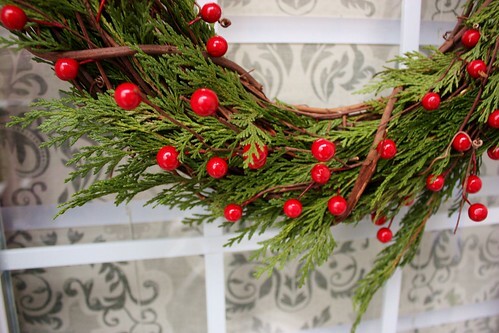 I started by cutting smaller branches of the cedar off the large branches and inserting them into the wreath form. They seemed to stay in place really well, so I wasn’t worried about wiring them in. I tried to tuck some of the greenery in under the larger branches to make them pop out a bit more. 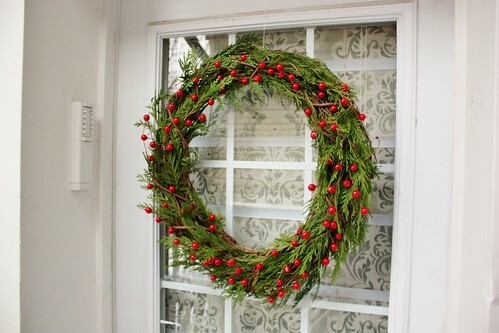 I continued going around the wreath in the same direction. After I’d done all the greenery, I added in the sprigs of red berries. 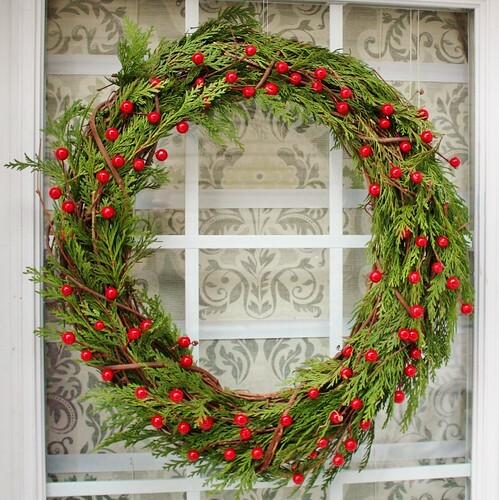 They come on a longer stick, but I cut it into smaller pieces and then inserted those into the wreath. The berries are on bendable wire, so I was able to bend them to stick out more and could use the wire to hold some of the loose greenery in place. I love how the grapevine + greenery + red berries creates lots of texture and contrast. To hang up the wreath, I made a loop with fishing line and then attached it to a hook inside the door. It’s strong enough to hold it in place, but you can barely see it. A big red plaid bow would have been a nice touch too. 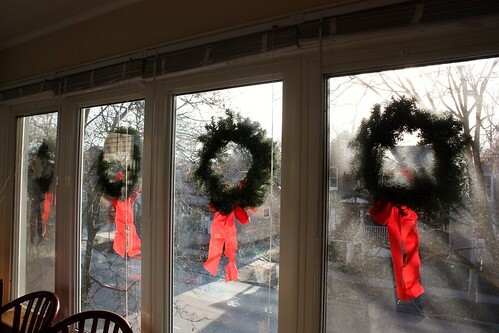 We also hung up our faux evergreen wreaths on the windows again with big red bows. 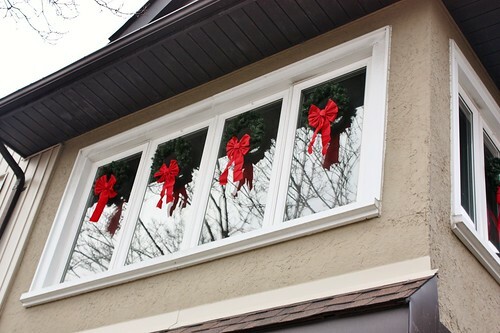 Not only do they look great from the road – but you can also see them inside when the blinds are all up in the dining room. Now that the tree is done and we have the outside done up, I only have a couple more projects to finish decorating…and then it’s time for wrapping! Bring on the clear tape! This is one of the prettiest wreaths I’ve seen all season. I love the simplicity of it, and I bet it smells wonderful! My parents have some evergreen trees in their yard. I’m going to have to keep this in mind for next year. Pinning this one!